Animefringe: Reviews - Mario Kart: Double Dash!! Comments: A rewarding game...with a few potholes. Set Mario and his buddies in a bunch of go-karts and let the mayhem begin. Seems like a simple concept, right? Well, more than ten years ago, the idea of a mascot-based kart-racing game was practically unheard of. Super Mario Kart, a 1992 release for the Super Nintendo, changed all that and led to a veritable flood of kart-racing games featuring everyone from Sonic the Hedgehog to Square's Chocobo and friends. However, none of the knockoffs have been able to capture the magic of Nintendo's series, even at the series' low points (Mario Kart 64). 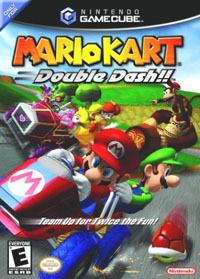 With Nintendo running second behind Microsoft's Xbox in the U.S.,Mario Kart: Double Dash!! is an important holiday title for the Big N.
Obviously, the biggest change from Kart 64 to Double Dash is the inclusion of two riders on one cart. In Double Dash one character serves as a driver while the other hangs off the back and acts as a gunner, pushing nearby karts or holding and throwing special items. The two characters can be switched at any time using the Gamecube controller's Z trigger button. Nintendo uses this new addition brilliantly, but misses some obvious features. For example, probably the most exciting addition to the series is the co-op mode. Two to four players can play on one or two karts – one player can act as the driver and one as the gunner. At first the idea seems gimmicky and boring for the gunner. However, it is a lot of fun and probably the most exciting new mode in the game. Despite that, Nintendo seems to make an miscalculation with the two driver setup; the two drivers you pick influences which karts you can use (bigger drivers can't use slower, heavier karts) and different characters get different special items (more on that in a moment) but switching between drivers during a race has little impact on the action (so much so that in one player mode, the drivers will switch automatically after you use an item). Other than the addition of the two-driver scheme, there aren't a slew of new features in Double Dash that effect the game play. Characters have special items, like the original Mario Kart (but now the player has access to them too). Characters get them randomly from item blocks and some of them are extremely good (Baby Mario and Luigi's chain chomp clears the way and drags their kart along for the ride) and some are pretty useless (Birdo and Yoshi's eggs). The other major addition to the game involves the karts themselves; as mentioned above, you can choose which kart you use and the different karts (all Mario themed, from warp pipes, to baby carriages, to Donkey Kong barrels) have different handling, acceleration, and top speed stats. The kart one chooses has a definite impact on the race. Other than those additions, the driving itself has been made a bit simpler. Power slides and the speed boosts have been made slightly easier, but one of the best aspects of the previous games, the ability to recover from slipping on an item by tapping the B button has been taken out. Players new to the series won't notice but it's hard for veteran racers to get used to. Graphically, the game is gorgeous and blows Kart 64 completely out of the water. The game has a bright, day-glow feel, similar to Mario Sunshine (indeed ,a number of tracks take place on Isle Del Fino). Unfortunately, instead of using the ultra-detailed character models from Smash Bros, Double Dash uses some less complex graphics for the characters, which is a shame, because it definitely shows. The music is the normally cartoony fare, though some of it is actually pretty catchy. Unlike Kart 64, the course design in Double Dash is pretty good; like the earlier game, Double Dash uses the Gamecube hardware and shows it off quite nicely, but unlike 64, the fluidity of the course and the fun of driving aren't affected by eye candy. And unlike Kart 64, the computer doesn't cheat as nearly as much; where racers you dispatched could come back from eighth and beat you up at first. This is much less of a problem in Double Dash. Items are still weighted (the farther behind you are, the better the items you'll get will be), but this too has less bearing on the races, possibly because of Double Dash's change to spinning out. In previous games, getting nailed by an item would bring your kart to a complete stop. However, in Double Dash a hit kart will slow down but usually won't completely stop because of most items (this changes for computer players as the difficulty ramps up, but it's far less rampant than in Kart 64. Often the gunner will be dragged behind the kart for precious seconds, slowing the team down. The game's difficulty level slowly works up to complete madness in the 150 class and Mirror modes; 50 and 100 class stand as good early stomping grounds, letting newer players wet their feet while the later modes are often killer. The game is quick to reward skills, with hidden modes, tracks, characters, and karts, unlockable when the player wins the gold in various races. Multiplayer is another major aspect of Double Dash. The brilliant co-op has been mentioned above; anyone with a friend or two who can play on a regular basis will adore this mode. The game has a few other multiplayer modes, including GP, which has eight karts and up to four players, Versus, which has two to four players against each other, and Battle Mode, which pits two to four players against each other in special stadiums. One battle mode has characters try and pop three balloons off another kart by hitting it with items, while Shine Thief puts a shine sprite from Mario Sunshine in the middle of the course. Whoever holds the sprite for fifteen seconds wins the match. The battle modes are the best since the original Mario Kart's but they don't quite have the same magic (though they're light years ahead of Kart 64's). Double Dash's Battle Mode is best for four players; it just feels a bit empty and quick with two. Double Dash is also Nintendo's second use of the Gamecube LAN system, where someone with two Gamecubes, two copies of the game, and two TVs, can link up for up to eight players. However, getting those kind of resources together is no small feat and the payoff is limited; Double Dash's LAN multiplayer is so limited that it's hardly worth playing. Hopefully newer games will take better advantage of it, because if Double Dash is the best the GC LAN can do, it's not even worth implementing. This is another must own Nintendo title for any Gamecube owner. Mario Kart: Double Dash! !, coupled with the new cheaper Gamecube, definitely has the potential to be this generation's Goldeneye, the must-have multiplayer title. If you've got some friends handy, this title is definitely worth putting down money for, despite a few problems. If you enjoyed the fun and magic of the original Mario Kart or the GBA's Super Circuit, you'll have a ball with Double Dash.